Do you need special text or a QR code on your PCB? Or a production date code specific to this order? Or a logo that your design system can’t handle? Or is it important that order numbers and UL marking are in a particular location? We have harnessed the power of PCB Visualizer to bring you on-screen interactive functionality to meet these requirements. Watch our movie at the end of this BLOG. Under Custom marking you can now add a company logo or similar image in legend, soldermask or copper. The image can be in JPEG, PNG, GIF or BMP format. All boards have our internal job number on the top legend layer in letters about 1 mm high. Using the new functionality you can move it but, as It forms the basis of our traceability system, you cannot remove it or place it outside the PCB outline. Where the customer requests UL marking our engineers have always placed it in a clear area on the legend at their discretion. If customers wanted to have the marking placed in a particular location, they needed to provide a drawing. Now, when time is tight, you can use PCB Visualizer to place the markings interactively on screen and see how the finished board will look without spending time on a drawing. UL marking is a cost-free option. 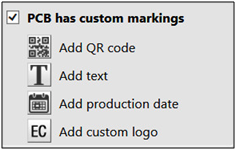 Custom marking may be a date code, text, QR code or LOGO. The new functionality allows you to select your preferred date code format. You can type in the text you want to appear as lettering or in the QR code. The logo can be imported as a JPEG, PNG, GIF or BMP file. In each case you can move the item around on screen to see where it fits best. Custom marking is now a cost-free option. Load the job into PCB Visualizer. Either use the Price Calculator to get a price and then upload your data, or use the “Analyse your data” option, so that PCB Configurator fills out the board parameters for you. Go to Shopping basket and click PCB Visualizer for the job you want. Scroll down the PCB Configurator menu to Advanced options. To add markings, make sure that the options you require have been ticked: “UL marking” or customer “Specific marking”, both at no extra cost. If you want to check or edit the placing of the order number and/or want to edit your UL and customer specific markings, click the “Marking” box. 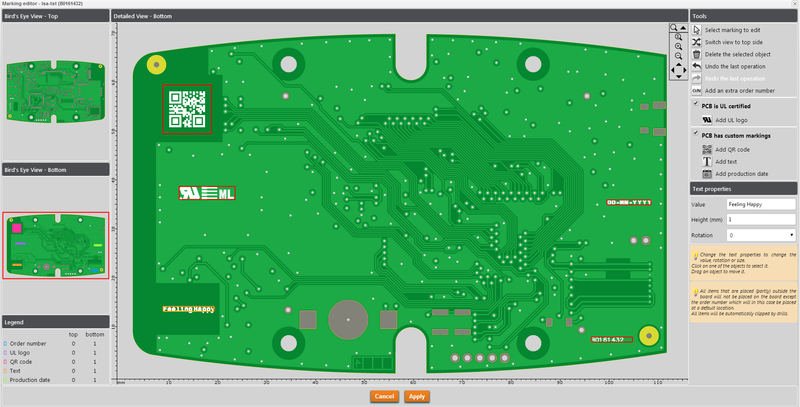 The Marking screen shows a bird”s eyes view of both sides of the PCB and one detailed view of either Top or Bottom, any markings already made, a legend overview of where they are and the tool options. 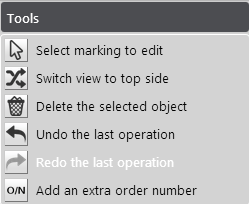 The function of the tools: “select”, “switch view”, “delete”, “undo” and “redo” need no further explanation as they are self-explanatory. The function “add an extra order number” makes it possible to add a second Eurocircuits order number on the PCB should you wish to do so. This function can also be used in case our automatic data analyses tool was not able to place an order number automatically on your PCB. This can be because the layout and legend of the board are too dense or the shape is too complex. You can then add an order number yourself. To place the order number, push the icon and move your cursor to the desired location on the board and click to add it. You can then still drag it to any position on the board either on the top or bottom. Moving it from the top to the bottom is easy by just moving it to the bird”s eye view of the bottom. This will place it there and will open the details view of the bottom at the same time. Further fine tuning of its position can then be done. You can also change the rotation. Don’t place any legend features over holes. Automatic clipping may render it illegible. The order number will appear in a legend layer, typically on the top layer. It is not necessary to have ordered a bottom legend to use the bottom layer for the order number. At this stage the order number will be the basket number. When the order is placed this will change to the order number. If you have not ticked the “UL marking” box in the PCB Configurator menu, you must tick the box here. This will open the UL menu here. The PCB Configurator menu and order details will be updated when you click Apply at the end of the Marking selection process. UL marking can appear on a copper layer, in the solder-mask, or on a legend layer. The size of the UL marking is defined by UL and cannot be changed neither should it overlap other items. At this stage there are no automatic checks to prevent the logo shorting any tracks or pads on a copper layer. Any problem introduced at this stage will be picked up by our data preparation engineers at the moment of order and will result into an exception that will be reported back to you. 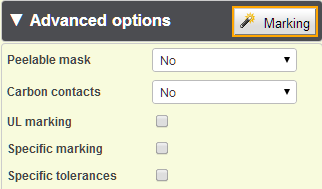 If you have not ticked the “Specific marking” box in the PCB Configurator menu, you must tick the box here. This will open the Custom marking menu here. The PCB Configurator menu and order details will be updated when you click Apply at the end of the Marking selection process. To add a QR code, click the icon and move your cursor to the desired location on the board and click to add it. You can then still drag it to any position on the top or bottom of the board. Moving it from the top to the bottom is easy by just moving it to the bird”s eye view of the bottom. This will place it there and will open the details view of the bottom at the same time. Further fine tuning of its position can then be done. You can then change the content of the QR code as well as the size. The Value can be up to 2953 alphanumeric characters using the standard ISO8859-1 character set (covers most characters in European languages). But the larger the content the denser the QR-code will become and thus the larger in size it will need to be to stay readable. The minimum legible size will depend on the number of characters used. In any case we do not allow a size below 8 x 8 mm. Anything smaller will not be legible. To add a custom TEXT, click the icon and move your cursor to the desired location on the board and click to add it. You can then still drag it to any position on the top or bottom of the board. Moving it from the top to the bottom is easy by just moving it to the bird”s eye view of the bottom. This will place it there and will open the details view of the bottom at the same time. Further fine tuning of its position can then be done. You can then input the text and adapt its height and rotation. Text uses the same ISO8859-1 character set as the QR code. We use proportional fonts, so the height of the letters determines the size of the box. To add the production date, click the icon and move your cursor to the desired location on the board and click to add it. You can then still drag it to any position on the top or bottom of the board. Moving it from the top to the bottom is easy by just moving it to the bird”s eye view of the bottom. This will place it there and will open the details view of the bottom at the same time. Further fine tuning of its position can then be done. You can then choose the date format and adapt its height and rotation. You have a choice of 6 formats. Select the format here. 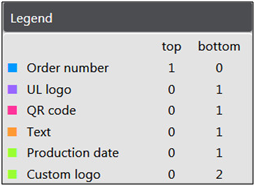 Our front-end engineering system will automatically insert the date on which we generate the production pooling panel. Select your image from the list of images already uploaded or use the Browse function to upload a new file. File format can be JPEG, PNG, GIF or BMP. Select the size of the image and the layer where you want it to appear. If you alter Height or Width manually the wizard will calculate the other dimension to preserve the original image ratio. Move your cursor to the desired location on the board and click to add it. You can then drag it to any position on the top or bottom of the board. Moving it from the top to the bottom is easy by just moving it to the bird”s eye view of the bottom. This will place it there and will open the detailed view of the bottom at the same time. You can then further fine-tune its position. The logo will appear in solid colour without grey-scales. If you prefer a pixellated grey-scaled image, use the PCB PIXture wizard in the PCB Definition box. Logos placed on legend layers are subject to Eurocircuits’ legend rules. The image will be clipped back from soldermask windows around component pads and holes. Also the narrowest line which can be successfully printed is 0.17 mm. Check your image size and placement as violations may impair the appearance of the logo. To view the final manufacturing files before we start production, use our Pre-production approval function. In the left bottom corner of the marking editor screen, you can find the “marking legend”. The marking legend gives an overview of all 5 markings that may appear on the board. It shows how many times a marking appears on top or bottom of the board. When you have placed the elements to your satisfaction, click Apply to return to the main PCB Configurator menu. The changes you have made will appear on Top and Bottom view. If they don’t, make sure that you have not switched off “UL marking” or “Specific marking”. Click the orange “Save changes” box on the right of the screen. In the next “Complete action” screen, just click Continue. If you upload new data, you will lose the placements you have just made. This film gives an overview of how to introduce custome markings on your board with our new marking editor module, part of our PCB Visualizer software.